Snow Sky, trained by Sir Michael Stoute, stylishly won the Lingfield Derby Trial. Ridden by Jim Crowley, a replacement for the injured James Doyle, the Prince Khalid Abdullah-owned 5-1 shot hit the front from the four furlong marker to win the race by two lengths. Mark Johnston's Hartnell (12-1), prominent throughout, took second, with Sudden Wonder (6-1) third and favourite Mekong River making no impression. The Epsom Derby takes place on 7 June. The last winner of the Lingfield Trial - run over one mile and three furlongs - to go on and win the Epsom showpiece was High Rise in 1998. 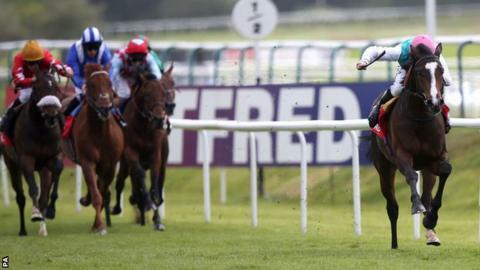 Lord Grimthorpe, racing manager for Abdullah, said: "We weren't totally expecting that. I think we have to go and sit down and give the Derby a consideration. "I'm sure Michael Stoute will want to talk to the prince and see what he wants to do but it's a happy place to be in." Like Lingfield, Epsom is a left-handed course and Crowley said the Surrey track "won't be a problem" for Snow Sky, who has now won twice in six outings and been installed as a 16-1 chance for the classic race.